When considering a high end infrared grill, TEC grills are normally top of the list. Slightly less well known are Lynx grills. But don't rule the Lynx out... it has a lot going for it. The Professional line of grills from Lynx are stainless steel and typically come in a variety of different sizes. They are available in both freestanding and built-in configurations, and come with a number of burner configurations (with or without the infrared burner, with or without a rotisserie.) They are actually just one piece of a large portfolio of outdoor cooking equipment, ranging from grills to refridgerators. So if you are putting in a grill as part of a larger outdoor kitchen, and you plan on adding additional appliances, going with Lynx allows you to get a matched set. The infrared configurations of the Lynx grills are typically blended designs, meaning that they have a traditional burner and an infrared burner. The tranditional gas burner is made from cast brass, and is hefty and very high quality. Ceramic briquettes are used to provide even hear distribution, and a hot surface ignitor is used for easy ignition. The ProSear infrared burner uses a ceramic catalytic design, and has variable BTU output. These ceramic burners tend to work great for searing applications, but you should assume that heat modulation will not be as linear as some of the other designs. Fortunately, the blended design of the grill means you can sear the meat on the infrared side, then contine to cook at lower temperature on the flame side should you desire to do so. 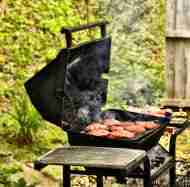 The grills are offered in propane and natural gas options, though expect much lower heat output when using natural gas. Lynx grills have a lot of nice touches, the sort you would expect on a high end grill. Blue LEDs illuminate the controls, and a very bright halogen light provides internal illumination. The lids have a very nice "lid assist" features, which makes the heavy lid easy enough to lift with your fingertips. These grills have a good reputation for build quality. Contruction is predominantly stainless steel, and there are hardly any screws... it is mostly welded construction. The grills have nice thick stainless steel grates. The exterior stainless steel and all burners come with a lifetime warranty, with other components having a 5 year warranty. Compared to TEC grills, the biggest difference is the burner design. If you like the thought of blending a traditional grill with infrared, and you are looking for something that is high quality, Lynx grills should be on your short list to consider.